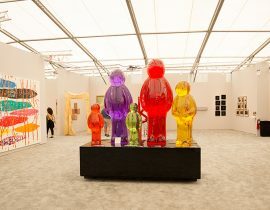 Modernism Week is a celebration of design, attracting more than 70,000 midcentury enthusiasts to the Palm Springs desert to view work from notable architects like The Alexanders, Raymond Lowey, Albert Frey and Donald Wexler. 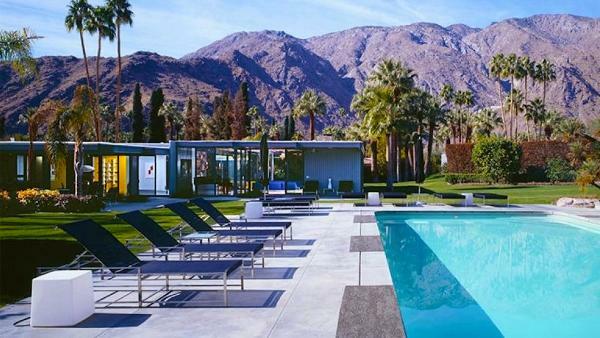 The allure of Palm Springs in February, complete with soft breezes and plentiful sunshine, makes it the perfect stop for a festival of modern architecture. The city overflows with historic house tours, “meet the builder” brunches, martini parties, architectural films, and behind-the-scenes tours of the backyards of the rich and famous. Properties in this sunny oasis are strewn with grapefruit trees and homes set themselves apart with doors painted pink, blue, yellow and orange. We created a guide so you can see all these tours, places to play and other landmarks during this architectural celebration. 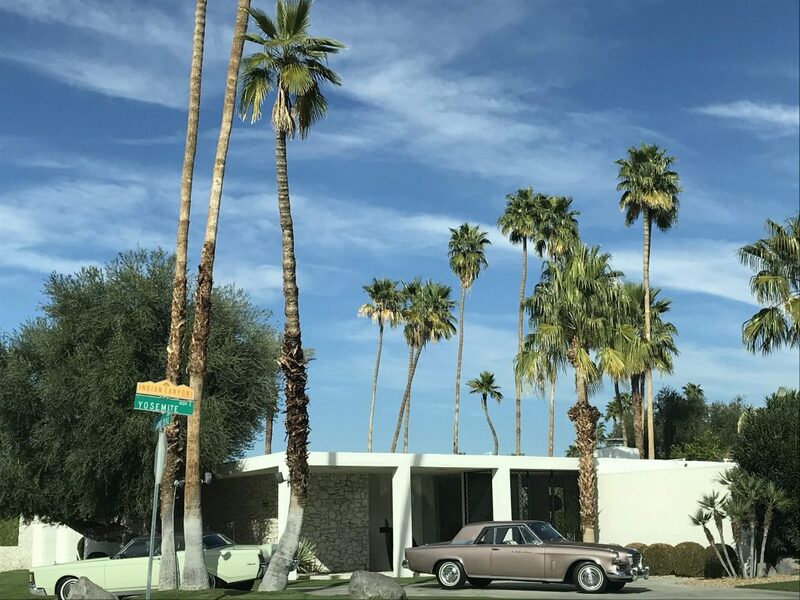 Palm Springs has an abundance of midcentury stunners on display, and here are a few iconic masterpieces that cannot be missed. 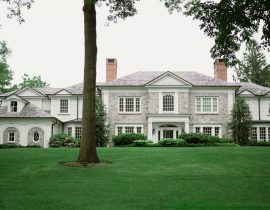 After making his first million, the Chairman of the Board commissioned this home for himself, and it was E. Stewart Williams’ first project. 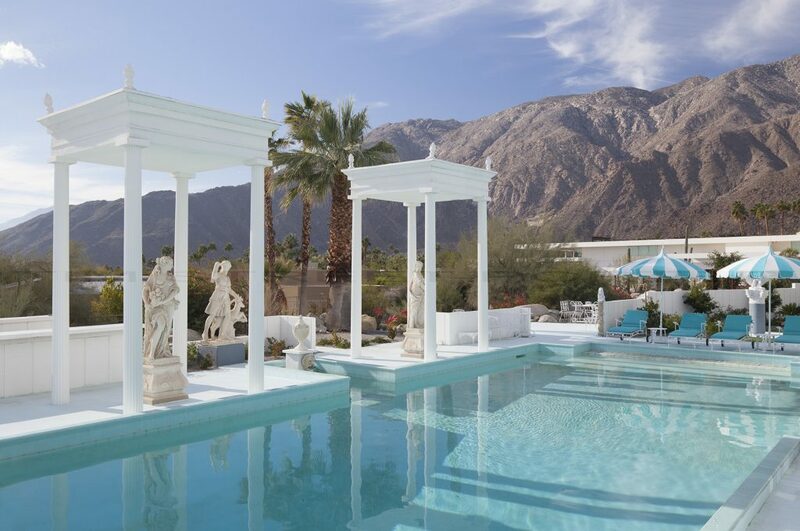 Twin Palms put Palm Springs on the map and served as a backdrop for salacious stories and legendary parties of the Hollywood elite, complete with a piano-shaped pool. Legend says that Sinatra would often raise a Jack Daniels flag between the twin palm trees (once the highest in the city), to signal to neighbors that cocktail hour had begun. Albert Frey was one of the most successful architects of our time, and his second home, Frey House II, was completed in 1964. Being conscious of nature, the hillside landmark was designed to have minimal impact on its surrounding environment and its various walls of glass provided the perfect overlook to the Coachella Valley. One of the most interesting features is that the pool and deck function as the roof of the carport. This elegant estate built in 1962 was built for the oldest son of publishing tycoon, William Randolph Hearst. Several of the home’s features were inspired by the Hearst Castle, and its neoclassical style appeared in the Liberace biopic, Behind the Candelabra. This iconic, mid-century home (reportedly now owned by Leonardo DiCaprio) was designed for Dinah Shore in 1964 and can be rented for $4,500 a night. 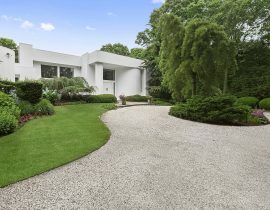 The single-story estate boasts floor-to-ceiling windows that wrap the majority of the home, 1-bedroom guesthouse, multiple fireplaces, and a heated pool and spa. Back in the day, Shore and Kirk Douglas created a special walkway between their adjacent tennis courts so they could conveniently visit each other. 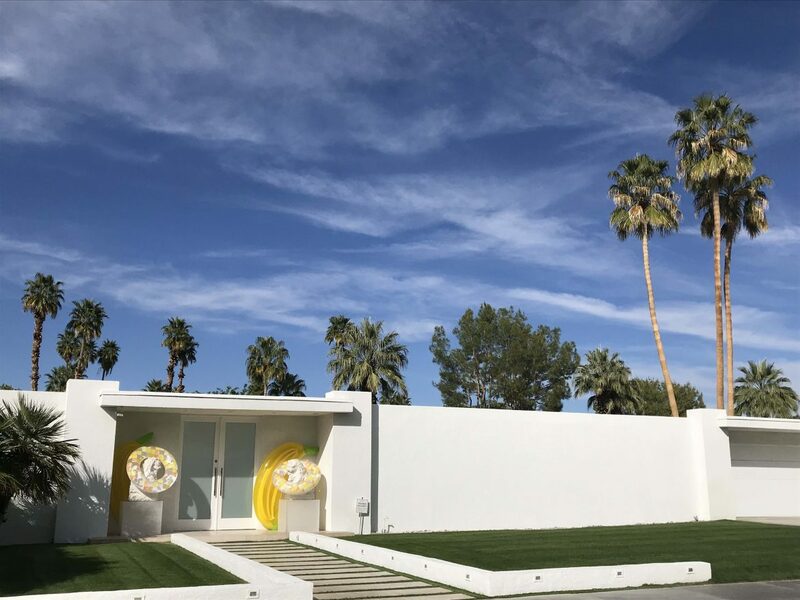 A trip to Modernism Week is a celebration that includes tours of iconic homes, enabling visitors to step back in time and inside surreal dwellings. A local shopkeeper notes that some tours allow you to show up and pay for a ticket at the door, so if a home tour is sold out, nab the address and try your luck. 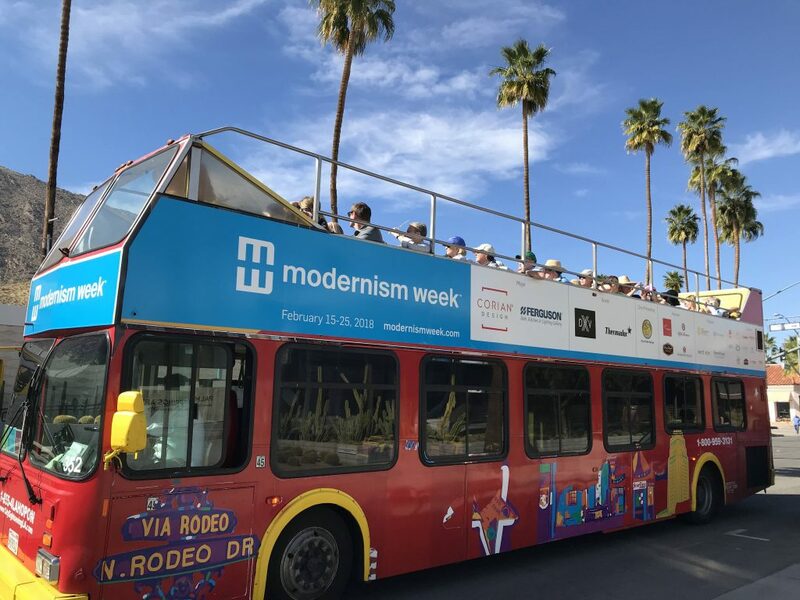 Enjoy the modernist masterpieces while getting a tan on the Modernism Week bus tour. The open-air tour guides visitors through the various modern civic buildings in the city, in addition to midcentury residential landmarks. 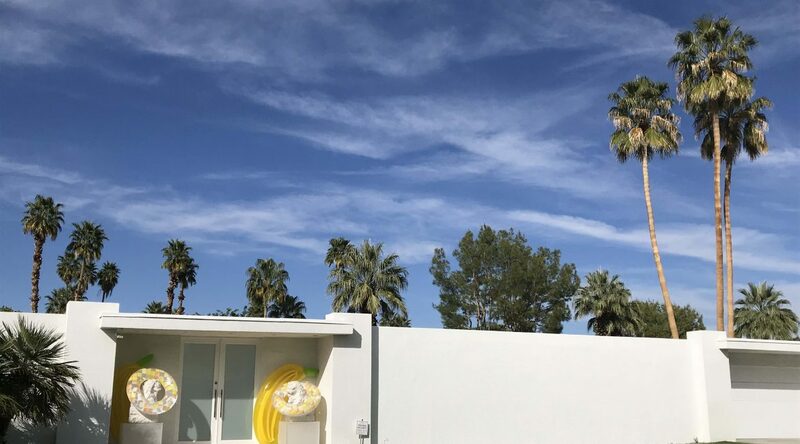 Modernism Week takes architectural buffs through a flurry of tours and neighborhoods, each featuring some of the world’s most renowned architects’ work. 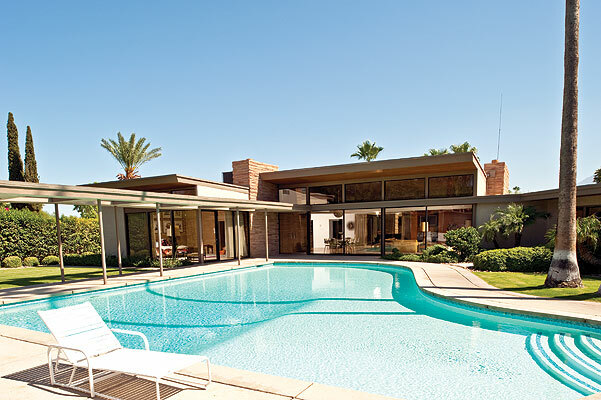 Take a tour through the tranquil Movie Colony neighborhood of Hollywood elites, the Racquet Club Estates of Alexander homes built in the 50s and 60s, or the Country Club Estates Tour, designed by A. Quincy Jones who was best known for the design of Sunnylands. A myriad of immersive home tours can be found here. For a sleeker ride and more hands-on experience, this VIP Signature Tour complete with personal driver takes guests inside architectural marvels throughout Palm Springs and includes a private reception at the new Kimpton Rowan hotel. 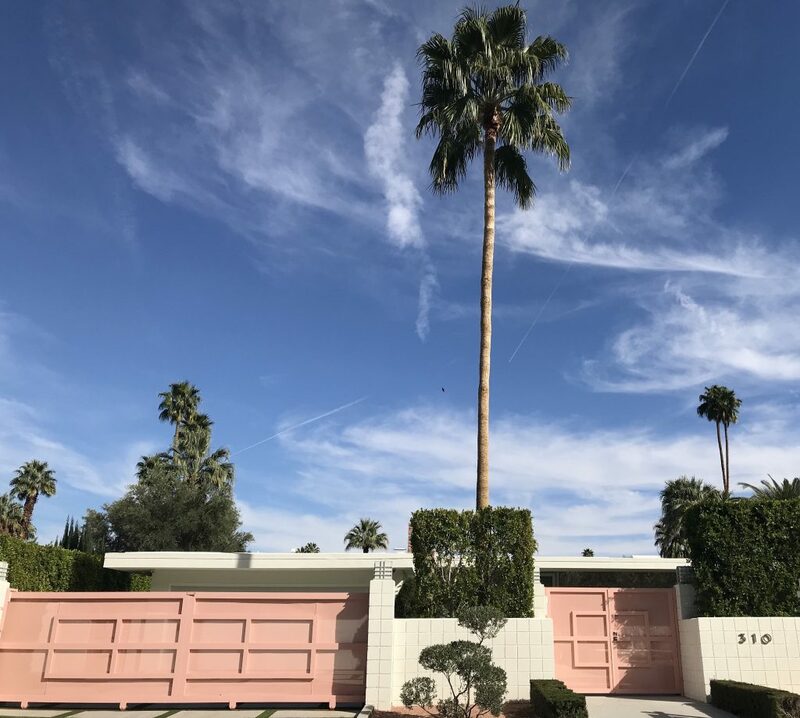 If a laid back, off-the-beaten path tour is more your speed, check out an array of historical walking tours led by the Palm Springs Historical Society or The Salty Canary. 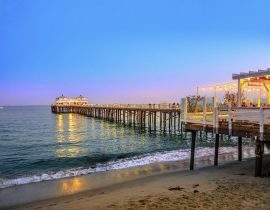 If you need a break from soaking in modern architectural marvels, this desert town offers an enticing lineup of attractions from star stalking to incredible outdoor adventures. 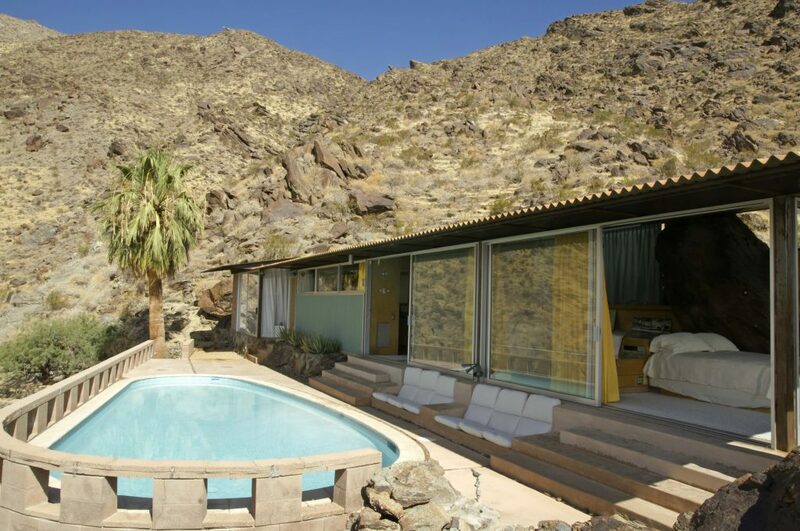 Many actors, writers, architects and artists called Palm Springs home and contributed to the growth of modern style. 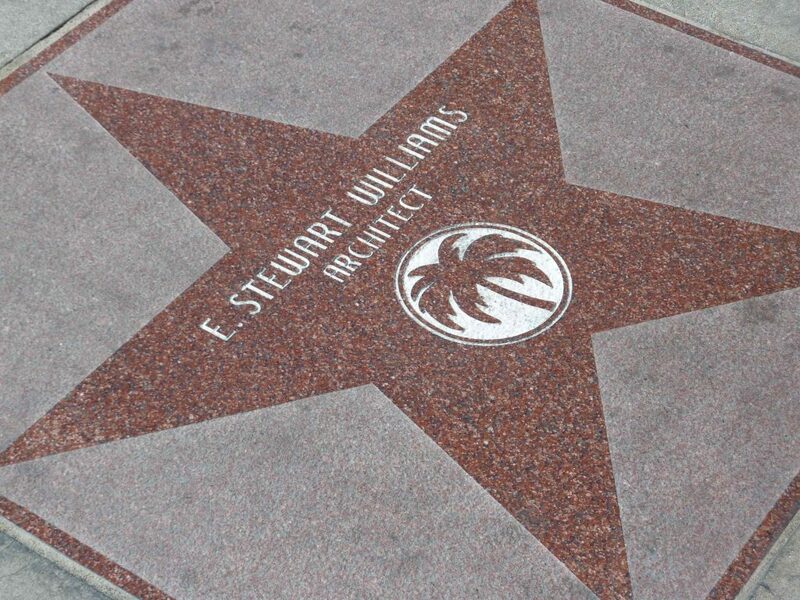 More than 300 of these stars are embedded within the sidewalks of Palm Springs, similar to the Hollywood Walk of fame. Stroll to Palm Canyon Drive and Tahquitz Canyon Way to spend an afternoon honoring these celebrities and maybe even spot one grabbing a cocktail at Copley’s, part of the former Carey Grant estate. 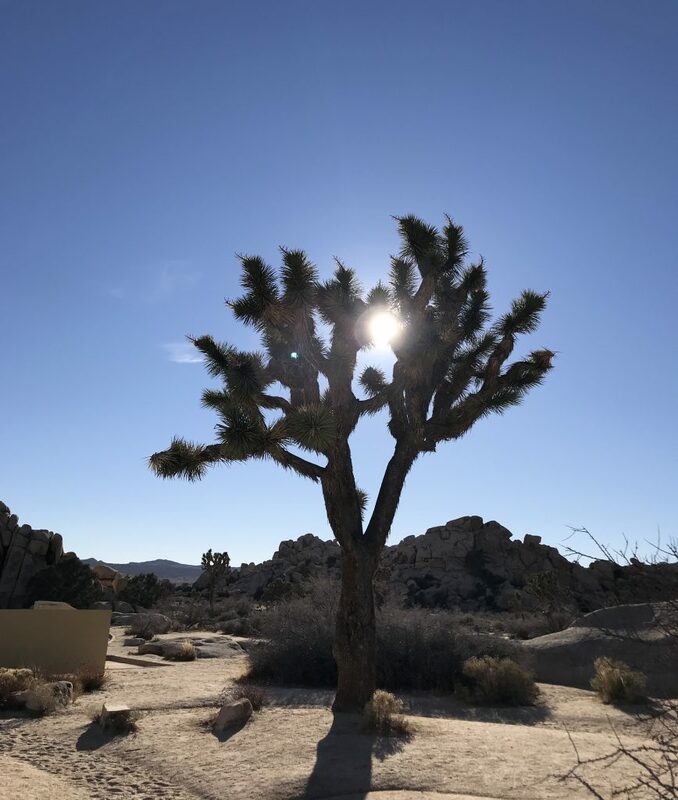 A short 40-minute drive from Palm Springs, Joshua tree is a series of sharp, feathery trees and rounded rock formations. Visitors can take a leisurely stroll through various trails, and more experienced climbers can tackle more than 400 formations. The park provides camera-worthy shots at every turn, including the night show where many visitors enter the park after hours just to see the stars. 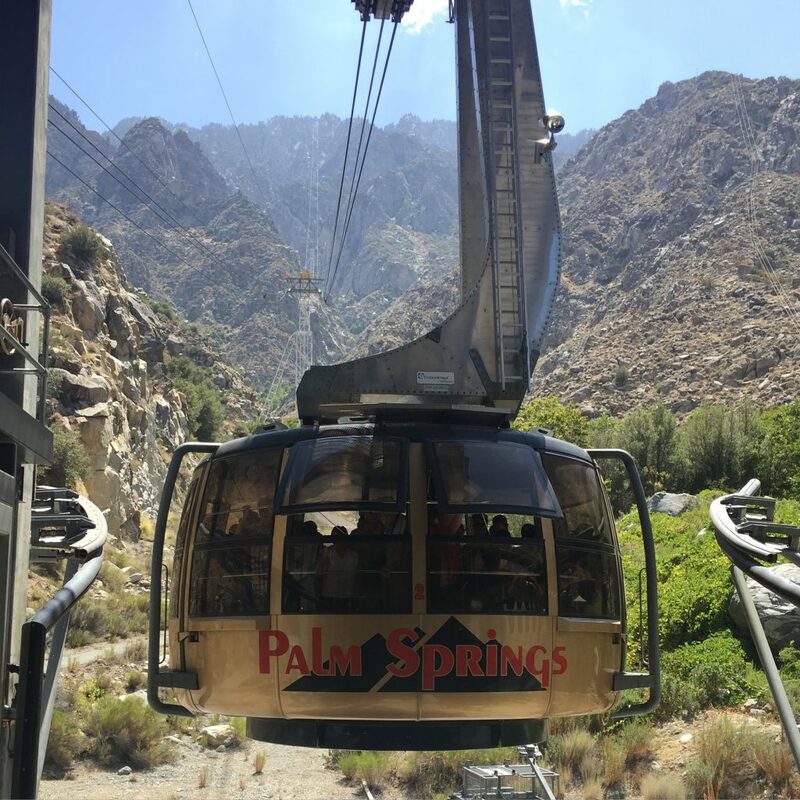 A quick 11 minute trip up a tram (that rotates for exceptional views from every angle), brings visitors to the top of the San Jacinto mountains. 54 miles of hiking trails set within lush green pine trees immediately greet guests upon arrival, in stark contrast to the palm trees at bottom of the tram. While you may be in Palm Springs, bring a coat and hat – temperatures drop 20 to 30 degrees once you reach the top. 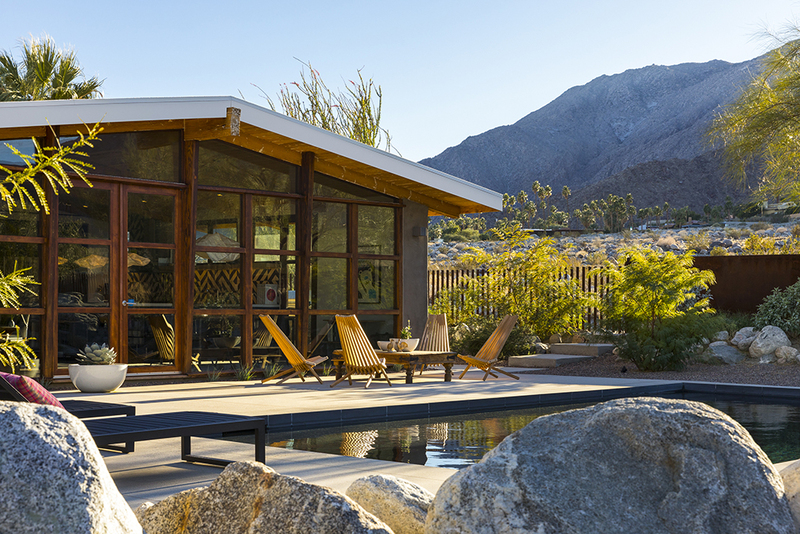 Search our listings to find your next home in the beautiful desert landscape of Palm Springs.